Can I Give My ferret Blue Buffalo Cat Food? | Can i Give My Ferret? Can i Give My Ferret? Can I Give My ferret Blue Buffalo Cat Food? Can you give your ferret blue buffalo cat food? As a ferret owner, you need to know a lot of information on how to properly take care of your pet. From a fellow ferret owner to internet forums, you may have heard or been told that cat food is not suitable for ferrets. Even if a cat and a ferret have so many similarities between them, there are also differences that need to be taken into consideration. This is to further know what is best suited for each pet especially nutrition-wise. Even if they are both carnivores, ferrets have certain strict diet needs. A ferret should be largely fed on animal protein and very less carbohydrates and fiber. A cat needs protein-rich food and this can come from different protein source including plants. This is where the difference in their food content starts. That is why even with the wide array of cat food available in the market today, one cannot easily feed a ferret with it. A ferret has a very sensitive digestive track and cannot take well vegetables and fruits mixed in food products. A ferret may fell ill because of improper diet. Cat food is not strictly forbidden for ferret in fact cat treats are given to ferret once in a while as a present or as training tool. With the extensive availability of cat food, it has come to attention that there are poor quality cat foods out there. Conscientious ferret owners who only want the finest for them are very meticulous in what cat food to give to their pets. That’s why there is a great need to check the label for only high-quality ingredients. To check the quality, the first ingredient of the product should be animal protein sources and some very few by-products. It is critical to know what the first ingredient is in any product because it means there is more of that ingredient in there than any other. To ensure the highest quality, a pet food should list real chicken, lamb, turkey, beef or fish as its first ingredient. Fortunately for ferret owners who may sometimes need to feed their pets with cat food, there is one brand that has passed the standards set with flying colors. It has been established that a good ferret food should contain at least 35% animal protein to be worth considering. Blue Buffalo Cat Food is one of the few cat food items out there that have 40% animal meat content. Yes, it has not only passed the minimum requirement but even exceeded them. It has been known to also exceed most ferret foods available in the market in quality. Blue Buffalo Cat Food line’s ingredients are what you want to find in a truly high quality and highly nutritious ferret food. It emphasizes on natural and healthy ingredients to give pets a holistic diet. All of their cat food products contain real meat as the first ingredient. This real meat is usually lamb, chicken, beef and fish. Aside from real raw meat content, Blue Buffalo also contains active nutrients and antioxidants. Cat and ferret, alike, will benefit from the protein content that are important for growth, energy, reproduction, repair and maintenance. Blue Buffalo Cat Food also comes in different flavors and formulas giving a wide range of choices. For really finicky ferret owners, they have a formula without grains at all. Grains and fiber products are not tolerated well by ferrets. It cannot be digested well, can cause allergic reactions and do not contain enough amino acid. Grains and fiber are also usually used as fillers in low quality cat food. It should be noted though that a ferret cannot survive on Blue Buffalo Cat Food alone. It can be a good addition to it’s highly protein rich diet as for sure ferrets also appreciate some variety on what they eat. 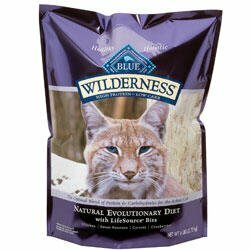 Blue Buffalo Cat Food is a good supplement to its existing food menu. Or when there are times that you cannot prepare ferret food in advance it’s comforting to know that there is a readily available product in the market that gives the same nutrition and even more and doesn’t sacrifice the quality. Because pets mean the world to most us just like our family does, it only follows that they are fed with nothing but the best just like how we fed our family with great care and thought. Please share. It really helps us a lot. Doesn’t Blue Buffalo cat food have fruits and vegetables in it? Isn’t that bad for ferrets? Can you Give your Ferret Snacks? Can I Give My Ferret Crackers? Can I Give My Ferret Dog Treats? Can I Give My Ferret Cheerios? Can I Give My Ferret Cat Treats? Can I Give My Ferret Boiled Eggs? Can I Get My Ferret Declawed? What Can I Give My Ferret For Diarrhea? Can I Give My Ferret a Cold? Can I Give My Ferret a Bath? What Can you Give your Ferret? Can I give my ferret a bone? Can I give my ferret raw mince? Can I give my ferret raw eggs? Can I give my ferret melatonin? Can I give my ferret Benadryl? What Can I Give My Ferret For a Cough? Copyright © 2019 Can i Give My Ferret? You should not rely on the veterinary advice or information provided on this site (or any site) for diagnosis or treatment of any specific situation. Always consult your own veterinarian for specific advice concerning the medical condition or treatment of your own pet or animal. The information provided on this site has been compiled from personal experiences, internet research, other readings, etc. You should never disregard or delay in seeking medical attention or advice because of something read here; this site is not meant as a substitute for medical attention. Please consult your veterinarian on any question you may have. You are responsible to provide the utmost care and attention to your pets, and we are at no time to be held responsible for loss, death, illness, injury or accident due to any cause, either natural or accidental.